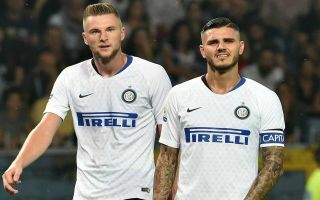 Manchester United, Real Madrid and other clubs have reportedly been cleared to take Mauro Icardi off Inter Milan’s hands this summer as long as they pay £68million. The Argentina international has had a difficult season after being stripped of the Inter captaincy, and it seems now that his future surely lies away from the San Siro. The latest from AS is that Real Madrid, Juventus and Napoli look like being suitors for Icardi, though just recently Man Utd were also linked with him in a potential swap deal involving Romelu Lukaku, according to the Express. The Red Devils could perhaps do with a quality signing like Icardi up front after a general lack of consistency from Lukaku in his time at Old Trafford. And if a player of Icardi’s calibre is now available for as little as £68m as AS claim, that could make him one of the bargains of the summer, and one United would struggle to pass up on. Still, it also seems clear they’d face plenty of competition for his signature, so it will be intriguing to follow this saga and find out where the talented 26-year-old ends up next.